Cirque du Soleil's Crystal combines skating with aerial wonder. Photo by Matt Beard. Cirque du Soleil’s latest touring masterwork is a lyrical wonderland of awe-inspiring athleticism. Forget the Ice Capades, Crystal is a new standard in ice entertainment. Following a loose story, Crystal is a young outcast who falls through the ice into a world of her own imagination. Her empowerment is echoed in the increasingly incredible stunts which culminate in an emotionally moving return to reality. Crystal, played by several performers, is by turns lonely, quirky, raw, and inspiring in the leaps – both literal and emotional – she makes through the show. She acts as puppet master for the stunt-driven numbers like “Playground”, a hockey game turned human pinball match, complete with ceiling to ice sized drops that left the audience clutching their metaphorical pearls. In “Tempête”, a clan of Dalmatian patterned acrobats mix traditional throws, flips, and spins with the speed and grace of compatriots on blades. But the biggest gasps were reserved for Crystal’s finale, “Ballroom”, which saw aerialist Crystal couple with her aerial straps/skating pas de deux prince in a shocking performance that questioned the boundaries of human flexibility. One small girl nearby asked if they did it with computers. 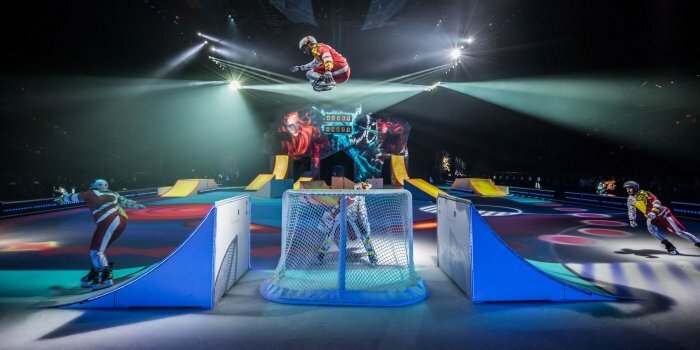 “A hockey game turned human pinball match in Cirque du Soleil’s Crystal had the audience clutching their metaphorical pearls. Photo by Matt Beard. The set design by Stéphane Roy is an enigmatic ice facade that provides the perfect playground for video content designer Johnny Ranger’s projections. The music by composer Maxim Lepage, and remixes by artists like Gabrielle Shonk and Betty Bonifassi, electrifies the atmosphere, providing a booming heartbeat to a heart-stopping show. With skating performances designed by legendary Canadian figure skater Kurt Browning, Cirque du Soleil’s first foray into the world of ice is spectacular. It is a world of wonder given an accessible spin by combining skating with the company’s signature acrobatics. Get your tickets now. This is not one to miss. Crystal. A Cirque du Soleil Production. Directed by Stefan Mijevic, Shana Carroll and Sébastien Soldevila. Playing at Abbotsford Centre (33800 King Rd, Abbotsford, BC) until April 15. Visit http://cirquedusoleil.com/crystal for tickets and information.